Excellent type, size and proportions. Strong in bone and substance. Well proportioned head, good ears, eye. Excellent forechest and front. Lovely neck and shoulders. Deep, strong body. Well angulated behind. Excellent coat quality. Cindy Pettersson, kennel So What, Sweden. - ФИНЛЯНДИЯ -	 Vandra Huber, USA юниоры 002, отл. 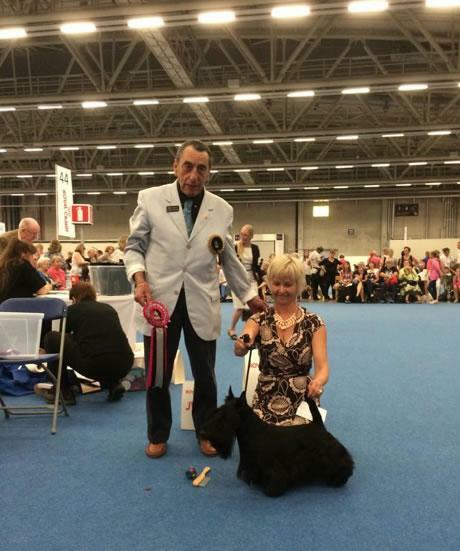 - ФИНЛЯНДИЯ -	 Clair Chapman, kennel Berrybreeze, United Kingdom - BOB, all classes. Cindy Pettersson, kennel So What, Sweden - puppies, juniors юниоры 004, отл. - ФИНЛЯНДИЯ -	 Viive Maranik, Estonia юниоры 001, отл. - ФИНЛЯНДИЯ -	 Nygard Marjo, Finland юниоры 001, отл. - ИТАЛИЯ -	 Herd Margaret, United Kingdom промежуточный 001, отл. - ХОРВАТИЯ -	 Gerhard Pollinger, Austria чемпионы 001, отл. - ХОРВАТИЯ -	 Zsuzsanna Petik, Hungary чемпионы 001, отл. - СЛОВЕНИЯ -	 Andela Ban ,Croatia открытый 001, отл.